Virginia.freelegalanswers.org, in just one year of operation, has reached more than 1,150 users, including 200 lawyers, and answered more than 450 questions. The online, interactive, pro bono question and answer website, notes its one year anniversary on August 22, 2017. The Virginia State Bar hosts the website, which is one of over thirty Free Legal Answers sites that the ABA has launched since 2016. Free Legal Answers provides legal information and assistance to low- and moderate-income Virginians in civil legal matters. Eligible clients are Virginia residents who have income levels of 250 percent of the federal poverty guidelines (or a household income of just over $29,000 per year for a single adult).They may post up to three civil legal questions per year. To date, Virginia’s Free Legal Answers site has over 1,150 users, including over 200 attorneys. Volunteer lawyers have answered more than 450 questions. Recently, the VSB Access to Legal Services Committee introduced a new way to recognize pro bono service, the VSB “Pro Bono Hero.” The Access Committee awards Pro Bono Hero pins, which feature the “ESQ” logo in a superhero shield, and certificates to thank volunteer attorneys who answer at least fifteen questions posed on Virginia.freelegalanswers.org or provide otherwise noteworthy pro bono service. 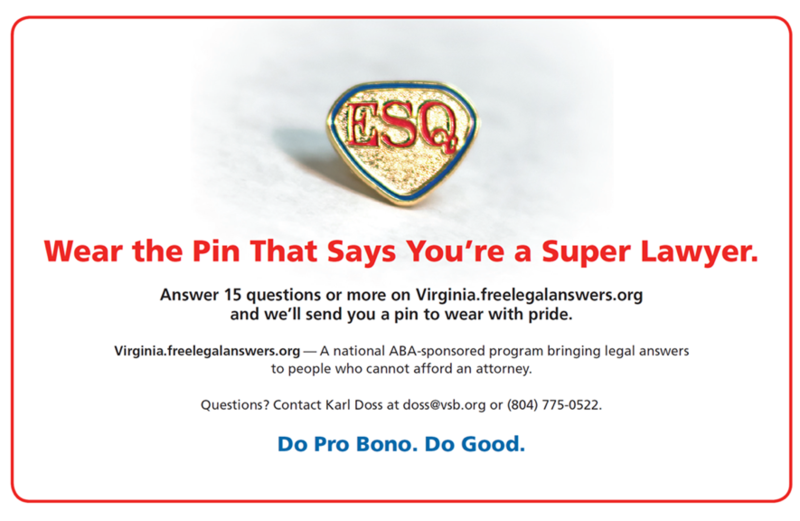 So far, the committee has sent Pro Bono Hero pins and certificates to eight Free Legal Answer attorneys: Ann M. Callaway, Warrenton; Elaine H. Cassel, Alexandria; Carole M. Hirsch, Alexandria; Donnie W. Salyers, Abingdon; Betty E. Scott, Portsmouth; Tammy L. Sossei, Richmond; Martin D. Wegbreit, Richmond; and John D. Williams, Williamsburg. The committee also recognized George T. “Buck” Lewis III, of the Memphis, TN, law firm Baker Donelson, who is chair of the of the ABA Standing Committee on Pro Bono and Public Service. Mr. Lewis, who spoke at the 2016 Virginia Legal Aid Award Luncheon, spearheaded the development and launching of the nation’s first statewide online pro bono question and answer website in Tennessee in 2011 and inspired the launch of Virginia.freelegalanswers.org one year ago. To register as a volunteer attorney, click Volunteer Attorney Registration, at https://virginia.freelegalanswers.org/ . Once you are on the home page, click https://virginia.freelegalanswers.org/Attorneys/Account/Agreement at the top of the page and follow the instructions. After your registration has been submitted and approved to make sure that you do not have a pending disciplinary matter, you are free to provide pro bono assistance by answering civil legal questions of your choosing submitted by low- or moderate-income Virginians. For more information, please contact, Karl Doss, Director, Access to Legal Services, at doss@vsb.org.